AMERICA MOURNS THE PASSING OF APOLLO 14 "MOON WALKER"
Early on Friday morning, February 5th, my friend Bob Reid notified me with the sad news of the demise of legendary Apollo astronaut Dr. Edgar Mitchell, who passed away in Florida on February 4th, 2016 at the age of 85. Every February 7th, I celebrate the life of the original "Flash Gordon" with a group of like-minded friends whose lives were touched, moved, inspired by the original Flash Gordon serials, starring the now-immortal science fiction movie hero, Buster Crabbe, who was born on February 7th, 1908. "Flash Gordon & The Purple Death From Outer Space"
"Flash Gordon's Birthday Dinner," which I convene each year is usually a happy celebration, but today is different, tinged by sadness as I reflect on the passing of one America's true Flash Gordon heroes, Apollo 14 astronaut and premiere "Moon Walker," Dr. Edgar Mitchell, in Lake Worth, Florida last Thursday, February 4th, 2016. Of course, as a young man growing up during "The Kennedy Era," I knew very well of Edgar Mitchell and his legendary "Moon Walk." However, more importantly, my interest in his flight was piqued further when I learned secret details of his lunar journey. Dr. Mitchell's work became of life-long interest for me because, as a Fordham University undergrad studying (para)psychology at the time of Dr. Mitchell's trip to the Moon, I became even more intrigued with his translunar experiences when I read in a major national magazine that while on the Moon and in his return to Earth, Edgar Mitchell had secretly conducted experiments in extrasensory perception, or ESP (as it was called then), including attempts at telepathic communications with friends and associates, acting as " psychic targets" here on Earth to receive his telepathic transmissions from the Moon! That item was an amazing revelation for the times. Although few details of the ESP experiments were given at that time, the simple fact that Dr. Mitchell, a world renown Apollo astronaut, had engaged in scientific ESP studies, instantly raised the respectability of ESP research as serious subject to be legitimately explored as Science (with a capital "S"). Furthermore, the revelation of Mitchell's ESP experiments instantly elevated the status, legitinacy and respectability of the small group of dedicated ESP investigators and researchers of the paranormal ( including UFOlogists) who, in general, were largely shunned by science and scientists (small "s") and who, held in disdain by mainstream science, had been relegated , banshed to "the outlands" of what was commonly labelled (and regularly debunked) as "fringe science." All of that changed on the day that a very "straight-laced" national news magazine profiled Apollo 14 astronaut Edgar Mitchell, reporting his remarkable feats of strength endurance during his Moon Walk. Foremost in mass media's attention was Mitchell's world record set while walking on the Moon for more than 9 hours. That is a record that may stand for 100 years or, perhaps, for even longer, given the chaotic state of world affairs today, and the consequent retardation of manned lunar exploration for the foreseeable future. As remarkable as the revelation of Dr. Mitchell's translunar ESP experimentation was, there was an even more amazing, but glossed over detail in the magazine article, which gave me a hint that "Something Really Big" had happened to Edgar Mitchell during the Apollo 14 flight, something which was being "played down" at the same time that it was being reported. I recall even now (after more than 40 years), the deep and curious impression that the reportage of this event made upon me, striking very strongly on a psychic level. I read the paragraph several times over as I sensed that there was a subliminal message in the account. I sensed that something of great significance was being veiled , (not quite hidden) but not ou in theopen. To me, the narrative implied something bigger than what was being told, and suggested in coded words, a vague description a cosmic event of some sort that had transpired during Mitchell's journey back from the Moon. I was intrigued by the magazine report that while returning from the Moon Edgar Mitchell had had a "peak experience" that involved a significant expansion of consciousness, one that was triggered by the sight of the Earth floating freely in space. The sense of euphoria he felt during that singular experience led Dr. Mitchell to enter a state of higher cinsciousness and gave him a sense he had made contact with a form of superconsciousness that tied all things together into One. It appeared to me that Edgar Mitchell had experienced direct contact with a higher mind, which conveyed a sense of Universal Intelligence. Hindu yogis desribe that state as arriving at "Samadi." Mitchell's brief description of this psychic state had revealed to to the world the veritable existence of a higher state of consciousness, a higher state of mind, potentially attainable by human beings to arrive a unity with, Universal Mind, . The concept of One Mind that is all-encompassing in nature is not new. In point of fact, it is more than ancient. 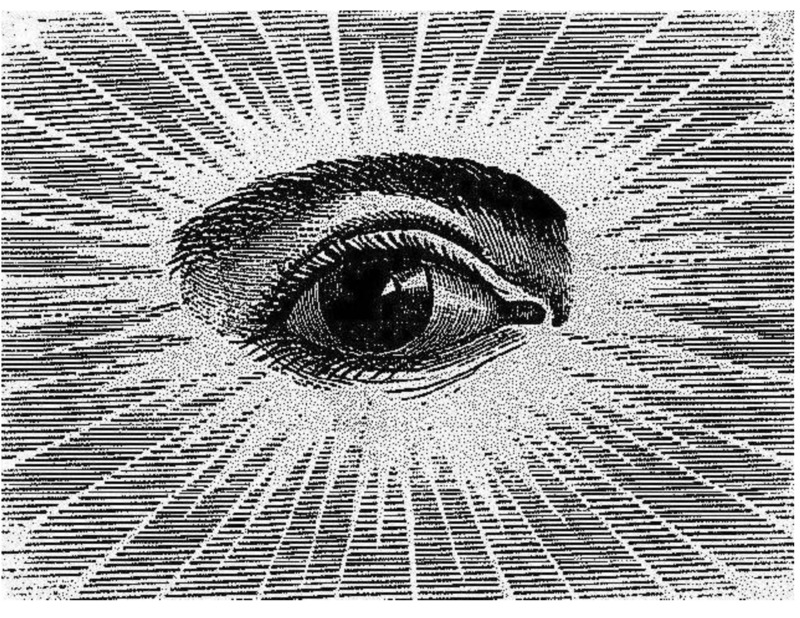 It is primordial, symbolized most readily by the image of "The Eye of Providence" or "The All-Seeing Eye." Arthur C. Clarke predicted in his novels, "2001: a Space Odyssey" and "Childhood's End," the eventual merger of the human mind with "Superconsciousness" to become The Star Child in "2001: A Space Odyssey," but even his prediction is even more literal and dramatic in "Childhood's End." The End of Mankind ( to be read here as "the purpose of Mankind") foreseen by Arthur C. Clarke in "Childhood's End," will be marked by the the absorption of all minds into one great, overarching field of awareness, which is Universal Intelligence. Clark foresees that Mankind, having evolved in some future altered state into a telepathic global consciousness, literally a form of "hive mind," will absorbed by a yet higher intelligence that is tantamount to God. In his apocalyptic scheme of things to come, Clarke's end suggests a union with The Divine, i.e. a personal union with the Mind of God, Itself, as unified state of consciousness, which the Swiss psychologist C. G. Jung called "Mysterium Coniunctionis," or "mysterious conjunction" the human mind with the divine prinicple in a mystical union with God. The Jesuit scientist-philospher, Teilhard de Chardin referred to that same concept of a "Universal Mind" as the "Noosphere," which means the Sphere of Knowing, or Universal Awareness, i.e Cosmic Consciousness, and from which the Institute for Noetic Sciences derives its name. Teilhard de Chardin's own "peak experience, which occurred in Asia 50 years before Edgar Mitchell's, gave Teilhard a vision of the Universe as a Single Living Being from its inception, called The Alpha Point, with a body composed in spacetime, growing, extending, expanding forever toward a destination to fulfill a universal purpose an end point called "OMEGA POINT." 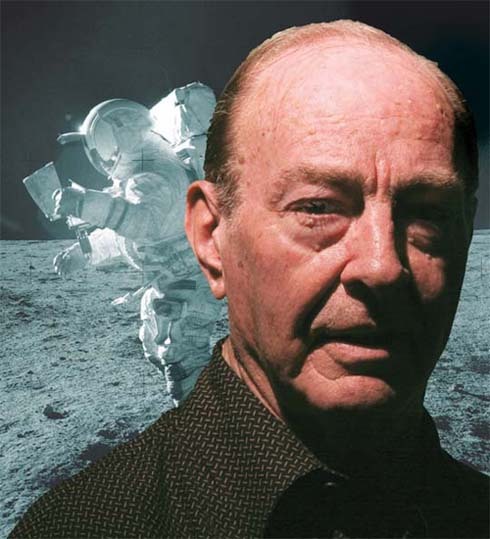 Of course, the magazine article did not state that "Edgar Mitchell has seen God," but it clearly suggested that something extraordinary, and quite outside of so-called "normal" human experience had happened to Edgar Mitchell "out there" between the Moon and the Earth. It was clear that its import was great. Something unusual, smething extraordinary, something beyond the normal boundaries of the human experience had had happened to Edgar Mitchell while on the Moon and, more importanly, during Apollo 14's transt through deep space to return to Earth. That memorable report made of me a lifelong student of Edgar Mitchell's work, the most important of which in my estimation were direct outgrowths of the "peak experience" that he had had transiting back to Earth from the Moon. These were Dr. Mitchell's establishment and founding of The Institute of Noetic Sciences (IONS) for the exploration of human consciousness, as well as, becoming a strong global voice promoting the peaceful uses of outer space, and working with Carol Rosin for the De-Weaponization of Outer Space. Just as President John F. Kennedy had donewith his contraversial Nuclear Test Ban Treaty in 1963 , Dr. Edgar Mitchell called for all nation to ban the proliferation nuclear weapons (or Star Wars technology) in outer space. "Mitchell's interests included consciousness and paranormal phenomena. On his way back to Earth during the Apollo 14 flight he had a powerful savikalpa samādhi experience, and also claimed to have conducted private ESP experiments with his friends on Earth. The results of said experiments were published in the Journal of Parapsychology in 1971. He was the founder of the Institute of Noetic Sciences (IONS) for the purpose of consciousness research and other "related phenomena". On the Opie and Anthony radio show, Buzz Aldrin described a psychic communication experiment that Mitchell conducted during the Apollo 14 flight, wherein Mitchell attempted to transmit information to participants on Earth. Wikipedia continues: "Mitchell claimed that a teenage remote healer living in Vancouver and using the pseudonym "Adam Dreamhealer" helped him heal kidney cancer from a distance. Mitchell said that while he never had a biopsy, "I had a sonogram and MRI that was consistent with renal carcinoma." Adam worked (distantly) on Mitchell from December 2003 until June 2004, when the "irregularity was gone and we haven't seen it since". " I finally got to meet Dr. Mitchell more than 30 years later, on January 30th, 2003, when he lectured at The Explorers Club in New York City, just 2 days before the tragic loss of Space Shuttle Columbia. It was there at the Explorers Club that I heard Dr. Mitchell recount in great detail the circumstances surrounding his "peak experience," which I had a chance to discuss with him that very night. Our exchanges at The Explorers Club began a 13-year long friendship and correspondence that lasted through this week, and I would add that if his translunar ESP experiments were successful (as they appear now to have been), I pray that our correspondence may yet continue for a while as we both know with certainty that we don't need postage stamps for telepathic contact, we just need the right envelope. A score of friends and fans of Dr. Edgar Mitchell have contacted me expressing their commiseration, sharing sympathies and the experiences that they had Dr. Mitchell over the years. UFO Digest salutes Dr. Mitchell as he crosses the bar, and in tribute present this memorial page to him and the historic achievements of the Apollo 14 astronauts. A peak experience is a moment accompanied by a euphoric mental state often achieved by self-actualizing individuals. The concept was originally developed by Abraham Maslow in 1964, who describes peak experiences as "rare, exciting, oceanic, deeply moving, exhilarating, elevating experiences that generate an advanced form of perceiving reality, and are even mystic and magical in their effect upon the experimenter." There are several unique characteristics of a peak experience, but each element is perceived together in a holistic manner that creates the moment of reaching one’s full potential. Peak experiences can range from simple activities to intense events; however, it is not necessarily about what the activity is, but the ecstatic, care-free feeling that is being experienced during it. discussing the life and times of a real "Flash Gordon." Below is a high resolution photograph taken by Edgar Mitchell while on the surface of the Moon, showing an anomalous (UFO) object that approached the Apollo 14 landing zone during his Moon Walk. 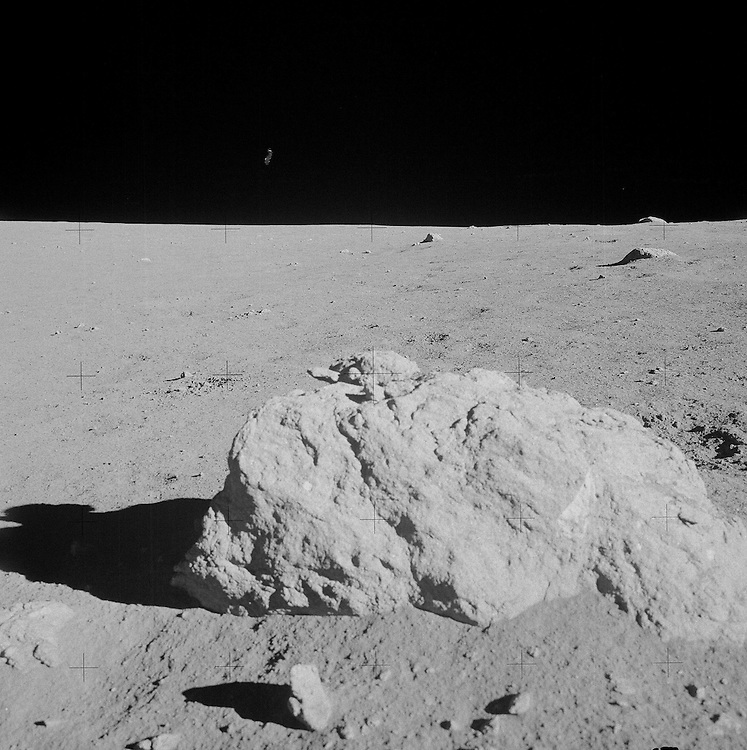 The photo shown above (AS14-68-9472HR) was taken by Edgar Mitchell as he shot a series of panoramic photos of the lunar landscape. I first brought this photo to Ed's attention in 2008, and again 2 years later, when we discussed the "sky object" again in greater detail when I shared my enlargements and enhancements with him during a conference call with him and fellow astronaut in 2010. To avoid "leading the witness," whenever Ed and I discussed this photo, on the phone or in emails, I refrained from ever calling it a "UFO," and so, for our mutual comfort in discussing it, I dubbed it "The Apollo 14 Sky Object," or simply "the sky object." "Hey, Robert! There really IS something there!" Perhaps it was something floating down that fell off the spacecraft.... (smile again). Godspeed, Edgar Mitchell ... Turn right at the first star, Gliese 876-c , and then go straight till morning! We shall meet again at Alpha Mensae. I'm too sad for words. Sending this with Love in Edgar's Peace. I sit here with our forth coming book on my lap, in tears thinking about my best friend in all this work for so many decades dedicated to maintaining the peace in space for peace on Earth since we started collaborating in '74. Ed's been so hoping Russia and China leaders will again champion the updated treaty ASAP that will ban all space based weapons so human conscious will rise and we can live sustainably and explore to learn more about ourselves and our cosmic neighbors. Ed knew there are no enemy ETs ... always repeating "there is zero evidence of that" and always supporting the Treaty signing, always trying to educate everyone about the vital importance of preventing the weaponization of space and the serious relevance of that to our being able to survive sustainably, and so humans can move in peace into the cosmos for all the benefits and opportunities. This will bring undreamed of benefits to Earth as we learn more about who we really are, and where we stand in the Universe. For Dr. Edgar Mitchell, Phd. Summary of a Life - "Crossing the Bar"
The speaker heralds the setting of the sun and the rise of the evening star, and hears that he is being called. He hopes that the ocean will not make the mournful sound of waves beating against a sand bar when he sets out to sea. Rather, he wishes for a tide that is so full that it cannot contain sound or foam and therefore seems asleep when all that has been carried from the boundless depths of the ocean returns back out to the depths. GEORGE BUSH SENIOR ON UFOs: "AMERICANS CAN'T HANDLE THE TRUTH!"